Max and I have known each other since college: classmates, friends, rock climbing partners, travel buddies… ah, what memories (some, like the time I indirectly puked on his foot, or when we trekked up to Annapurna Base Camp in Nepal, are more epic than others). I’ve been along on many of his photography trips, and have slept through a number of his award-winning shots, including the lightning strike at False Kiva (the first picture you see on his website. I wrote about it here: The eyes of this place). It’s hard to stay awake at night when you have to sit in the dark for long periods of time. He was worried that we were going to get struck by lightning, or soaked to the bone in the pouring down rain. I sat up, remember saying, “Oh look, that’s some big lightning,” and then immediately fell right back asleep. My mom did always used to say that you could send a marching band through my room and I wouldn’t wake up. 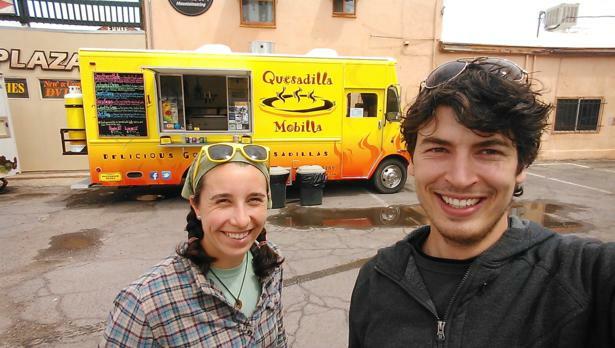 Myself and Max, about to chow down on some delicious quesadillas in Moab, Utah. I’m also asleep just out of the frame on the left in his self-portrait at Delicate Arch with the Milky Way (in both Personal Favorites and Night Shots). I tucked myself out of the way behind a rock, determined to sit there and enjoy the night sky. It was cold, so I had brought a down sleeping bag to sit in, and, well, when I’m warm and tired and it’s dark I tend to fall asleep. Max actually didn’t even know where I was, and had to call out for me a few times so I didn’t get left behind. I also almost got lost trying to get out to the Arch that night (actually, I believe it was technically early morning), because my headlamp battery was dying, and I could only see in a 1 foot circle around my feet. Which isn’t so bad when you’re on a trail, but once you’re on slick rock and relying on rock cairns to direct you, it gets a bit trickier. There were a few moments I thought about just sitting down and waiting for Max to come find me once he was done taking pictures. Luckily, I’ve been out to Delicate Arch a number of times, and was fairly familiar with the trail. And, another photographer had left some glow-sticks at a few strategic points along the trail, which helped. 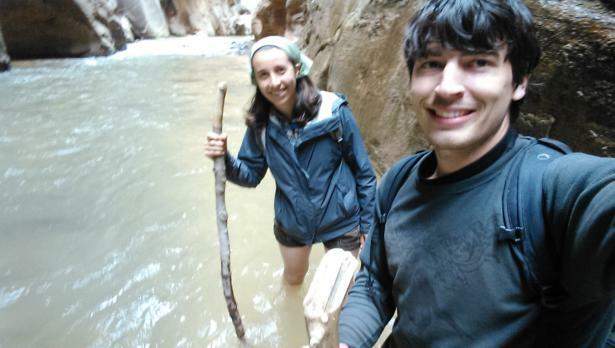 Hiking the Narrows, in Zion National Park, with a bum foot. I think the freezing-cold water actually helped, because I went numb from the upper-thigh down. He’d left me behind, as usual, because he was in a hurry to get up there and start taking pictures, I had to use the outhouse before I left, and I had badly sprained my foot just before we left on our trip and couldn’t really walk very well. In hindsight, I probably should have just stayed in the car. I should have also probably gone to the doctors and had it checked out, but we Smiths tend to follow the “walk it off” recovery method. Which could explain why my knee, which I dislocated a few years ago, still bothers me every once in a while (after my kneecap eventually popped back into place, it didn’t hurt as bad so I just kept working). 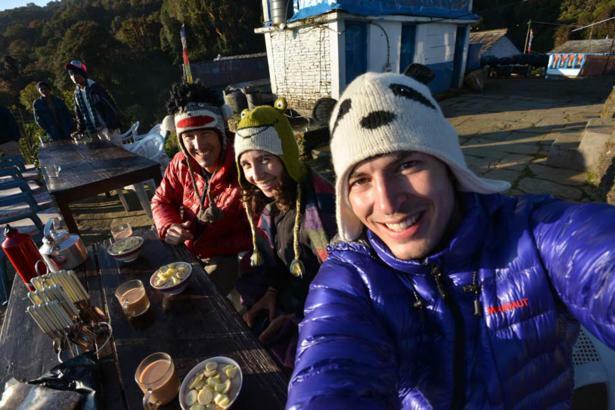 Joby, myself, and Max, enjoying breakfast on the trek up to Annapurna Base Camp in Nepal. The porters and other people we met along the trail all got a kick out of our sweet hats.